Join Strength Matters for a one-hour webinar on the new Functional Expense Reporting requirements. 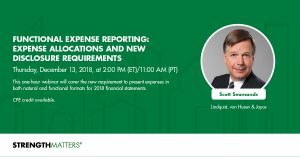 Scott Seamands of Lindquist, von Husen & Joycewill cover the new requirement to present expenses in both natural and functional formats for 2018 financial statements. Although we are not yet part of the NASBA Registry of CPE Sponsors for webinars, we follow NASBA guidelines in our program. 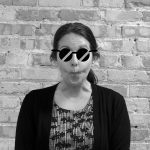 You may request a certificate of completion and petition your state board of accountancy to request that the credits be allowed. State boards of accountancy have final authority on the acceptance of individual courses for CPE credit. Discuss the new requirement to present expenses in both natural and functional formats for 2018 financial statements. Advanced preparation required: None required. Participation Requirements: To receive a certificate of completion for a webinar, participants must be logged into the webinar and dialed into the audio portion (if joining audio by computer, no separate dial-in required) by 10 minutes after the stated start time, complete all engagement activities (including polls), and participate in the full webinar. Please email consult.lwells@gmail.com after the event to request a certificate. Contact: For more information regarding policies, or to issue a complaint, please email Lindsay Wells at consult.lwells@gmail.com or Angela Gravely-Smith at AGravelySmith@nw.org.